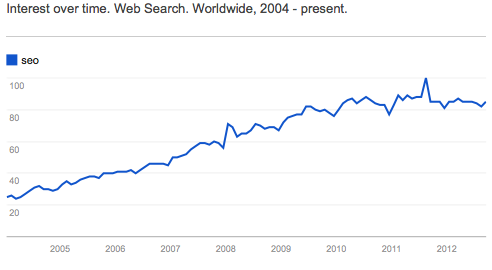 I have heard some chatter that “SEO is dead” others are saying it’s stronger than ever. Personally, I believe SEO is not dead, but the terminology is making a shift from SEO to Inbound Marketing, and appropriately so. As a marketer, calling myself an “Inbound Marketer” carries a touch of prestige that calling myself an “SEO” does. Sadly, SEO has a slightly negative connotation in the minds of upper level execs and business owners. SEO, as we knew it, consisted of on-page optimization and link building using: reciprocal link trades, blog networks, link buying and keyword stuffing. That was about all it took to rank well in search engines. Google makes approximately 500 algorithm changes/year now in defense of old school SEO tricks that manipulate their rankings. SEOs have been forced to diversify their portfolios in the modern SEO world, ever increasingly known as Inbound Marketing. 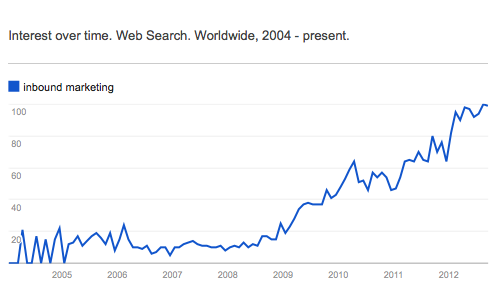 According to Google Trends the buzzword is on the rise, while SEO seems to have peaked in 2011. This doesn’t mean that on-page optimization and linkbuilding are dead. It just means we are calling it something different. SEO is still alive and kicking but our jobs have been diversified and we now wear many hats. Instead of having a select few tricks to rank our websites, we now have to be creative and do things that would traditionally be produced in a creative boutique or ad agency. The end result is still links and no matter if we say: “Inbound” or “SEO” we are still getting people to link to our websites. This entry was posted in Inbound Marketing, SEO by Russell Jensen. Bookmark the permalink.